Surrey Satellite Technology Ltd (SSTL) signed in November 2006 a contract in Abuja for the supply of the NIGERIASAT-2 Earth observation satellite, related ground infrastructure and a training programme to further establish a national indigenous space capability in the Federal Republic of Nigeria. 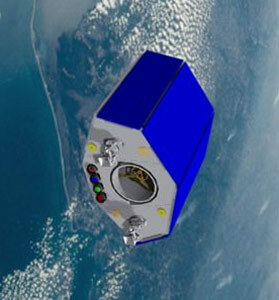 The selection of SSTL by the National Space Research and Development Agency (NASRDA) of Nigeria follows a detailed technical evaluation and due diligence undertaken by NASRDA's procurement advisor, Telesat of Canada, confirming the UK company's position as the world-leading supplier of advanced operational small satellites. The new 300 kg satellite, for launch in 2009, will provide Nigeria with valuable geographically referenced high-resolution satellite imaging for applications in mapping, water resources management, agricultural land use, population estimation, health hazard monitoring and disaster mitigation and management. SSTL will develop NIGERIASAT-2 based upon its new generation of high-resolution Earth observation satellites to provide affordable access to space, using the latest advanced small satellite technologies developed from the TOPSAT and Beijing-1 missions launched successfully in 2005.